These video lectures will allow the author, Bill Mounce, to walk with you through each chapter, explaining the concepts so that you do not have to learn alone. The videos for all the textbook, Greek for the Rest of Us, are available, along with screen casts showing the practical application of what is taught in the chapter. This first section is called Foundational Greek and will teach you enough Greek to understand your Bible software and to do Greek word studies. Church Greek teaches you enough Greek to use reverse interlinears. Functional Greek teaches you even more Greek so you can use traditional interlinears. 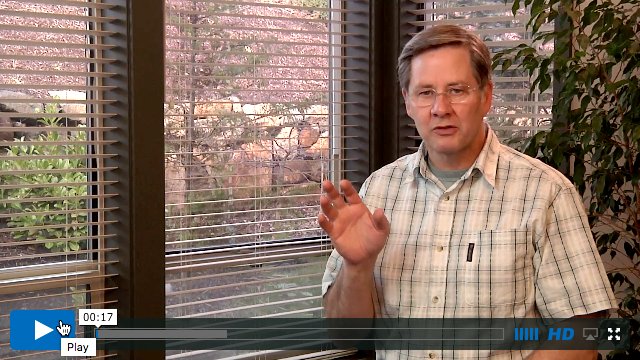 Each lesson has a video lecture where Bill explains the Greek in approachable ways. Many lessons are followed by a screen cast of Bill using his Bible search software to show you how to use this new knowledge to go deeper in your Bible study. This hands on experience is crucial to learning and applying Greek to your Bible study. "I wanted to let you know how much I appreciate your work and willingness to share Foundational Greek with our church, Westminster Presbyterian in Johnson City, TN. The class has just finished and I had several participants who wish to continue their study of Greek. More than one student is already applying what they learned by digging deeper as they lead Bible studies. "We found Dr. Mounce to be easy to follow; the length of each lesson was just right for a class of adult learners outside the seminary. The lectures were easily supplemented by materials from the website.... The combination of video and short assignments was just right for a Sunday school class. I will recommend this course to other churches in my denomination, and hope to take a group to the next level fairly soon." You can view the first three lessons for free in our free online class. The Greek Language. Bill will set Koine Greek in its historical position and, incidently, show that English does not come from Latin. Alphabet & Transliteration. The natural starting point in the Greek alphabet. Transliteration is the process of representing a Greek word with the English alphabet. Most books refer to Greek words with their transliteration. Pronunciation. The final step in this first stage is to learn to pronounce words. It helps to remove any initial fears you might have at learning Greek. English Noun Inflection. In this chapter we are introduced to the concept of inflection, and specifically that of noun inflection in the video series. Greek Noun Inflection. After the alphabet, inflection is what makes Greek the most different from English and hard for us to understand. Inflection just means that words change their form because of differences in meaning and function. We are so convinved that you will love the video series that your purchase is guaranteed. If you are unhappy with the video series and return it within 30 days of the invoice date, we will refund the purchase price (less PayPal charges, if applicable, and shipping).